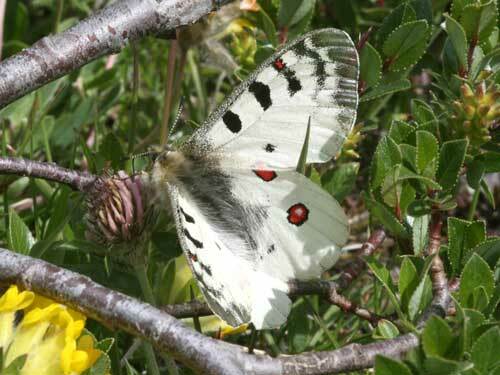 A widespread but very local butterfly, it is much less fequently encountered than the similar apollo, P. apollo. 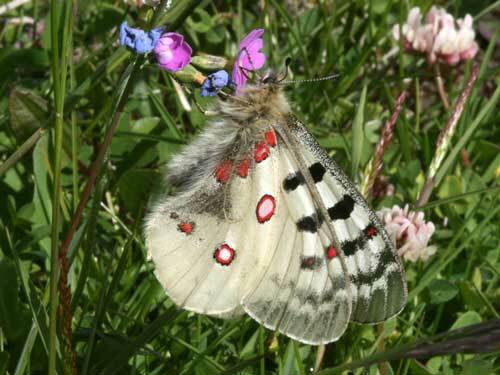 Identification & Similar species: It is a large white butterfly with distinctive red and black rings. 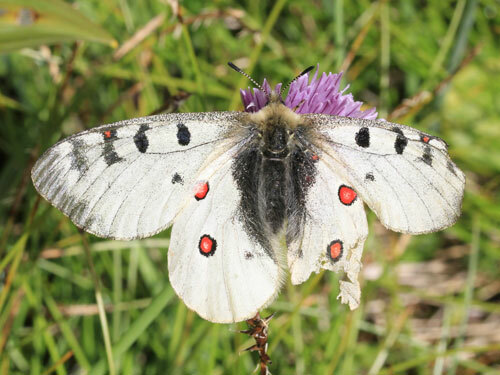 It is only found in the Alps and is similar only to the apollo, P. apollo, with which it can fly differing in two ways: (usually helpful) red marks on forewings near apex and a defining feature the boldly striped black and white antennae. Distribution & Flight: The Alps of France, Switzerland, Italy and Austria. 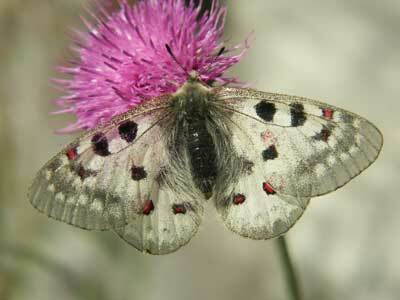 July is the best time for fresh specimens, flying into August. 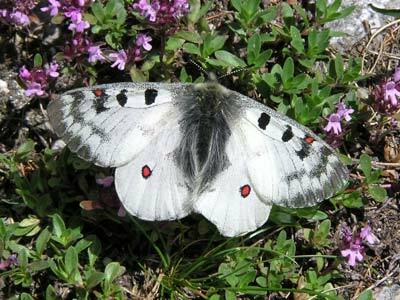 Habitat & Behaviour: Usually grassy places in the shelter of gulleys, cliffs or, at lower levels, at the edges of woodland. Generally at higher levels around 2000-2200m but I've seen it as low as 1600m (single records) and upto 2400m (can be common). 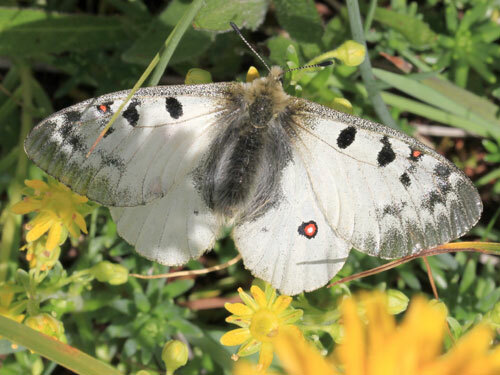 Behaviour is similar to the apollo, P. apollo, their flight is not particularly graceful or strong but if disturbed can move very quickly with powerful strokes of their large wings. 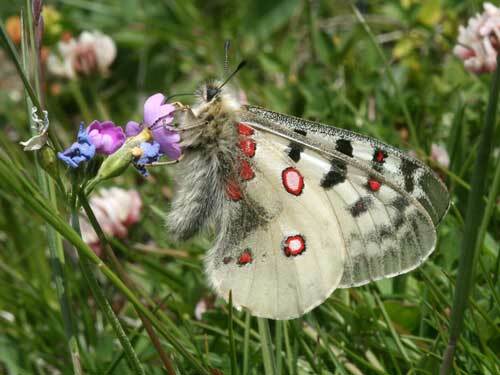 Also similarly graceless when "crashing" into flowers to feed. 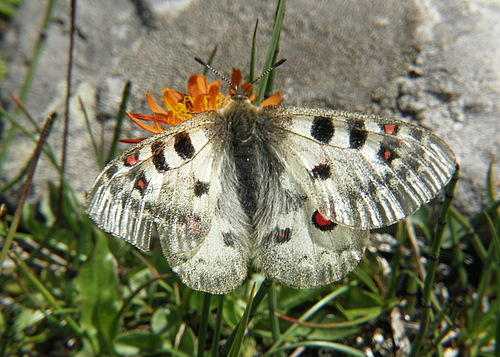 Variation: Unlike its cousin, the apollo, P. apollo, this species varies little. 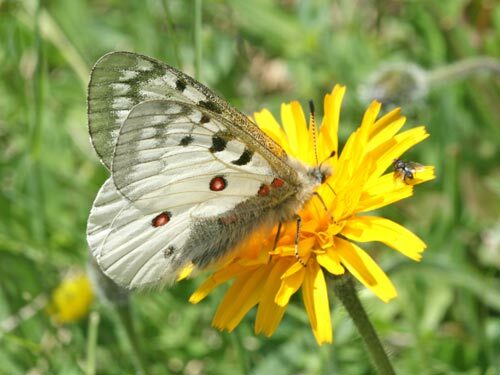 Striped antennae confirm the small apollo P. phoebus but most unusually there is no red on the forewing near the apex.